To find the leak, it’s a good idea to check your irrigation controller first, valves second, and sprinklers last. Use brightly colored irrigation flags to mark areas you suspect may be leaking. Although irrigation controllers do not leak, they contain an electrical clock which controls your spring valves. The clock triggers the release of water through sprinkler valves and keeps sprinkler valves open for a predetermined time period. Check the controller’s programming to make sure it hasn’t changed or returned to a default setting that increases water usage. In some cases, irrigation controllers may keep sprinkler systems running unnecessarily for hours, which can significantly increase your water bill. Valve boxes should be dry, not flooded. Wet valve boxes may indicate loose wiring, water leaking due to damaged fittings, or worn parts. Flooding around the sprinkler’s base – may indicate malfunctioning valves which are not shutting off properly. Water sprays/geysers – usually indicate missing sprayheads. Water spraying between sprinkler heads – could mean you have a cracked lateral line. Water laying in the grass between sprinklers – usually indicates a steady leak coming from an underground pipe. 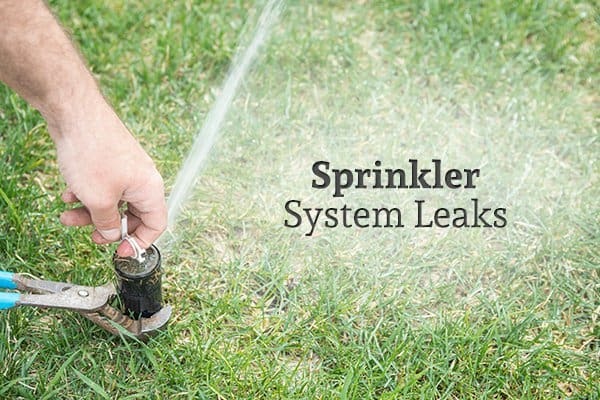 Water spurting from a sprinkler’s base – could mean that a seal is broken where the riser or nozzle connects to the underground supply line. Although misaligned sprinkler heads are not technically a type of leak, check to see if they are spraying water exactly where you want them to spray. If you own a business which is closed on the weekends, always check your sprinkler heads before leaving for the weekend. Loose heads may suddenly deviate significantly off their mark after you leave for the weekend. Leak detection tools are available to help you locate a sprinkler system leak, but using them is time-consuming, and they may not successfully detect the leak. Tools include water leak microphones (sensory rods you wave over the ground that enhance the sounds of water gushing through pipes) and electrical acoustic kits. When underground pipe leaks are large enough, you may hear water gushing even without a sensory rod. Experienced plumbing and sprinkler technicians have the in-depth knowledge and industry-specific tools to quickly find leaks and repair them without damaging your lawn. They can also provide regular maintenance and inspections to ensure that your sprinkler system works properly and your lawn stays green, lush, and beautiful. To get your sprinkler system expertly maintained or repaired, call HEB Plumbing & Sprinkler today. What’s the Best Type of Yard Sprinkler for Me?